Keeping the style of your home up-to-date is an ongoing process. Often, those changes are directed to high traffic areas such the kitchen, bathrooms or living room. Making changes to your master bedroom can create a tranquil spot for you to retreat after a long, busy day. From simple one-step changes to complete overhauls, the following offer some master bedroom ideas for any size space. 1. Create a focal point. No matter what size your bedroom is, creating an appealing focal point will give balance to the space and establish the look and feel of the room. Since the bed is typically the largest piece of furniture, focus an eye-catching design piece here. Use your headboard to make a statement. If your budget doesn’t permit you to purchase a headboard in your favorite style, create one by purchasing a basic door or shutters from any home improvement shop. You can stain or paint them to match your room’s color scheme. Hang a bold painting, favorite picture or sculptured piece above your bed. Unless you’re planning a complete overhaul, choose something that will complement your existing design look. Change your lighting fixture. This can be both a simple and inexpensive way to implement a dramatic change in your room. Most fixtures are easily installed without expert help. Just be sure to turn off the main electric supply switch before you start. 2. Swap out linens for a whole new style. This is another one-size-fits all updates that can make you feel like you have a whole new room. Older linens and pillows can not only show a lot of wear and tear, but also be uncomfortable to sleep on. If you want something that is more budget-friendly, choose a variety of neutral toned sheets that you can easily mix and match. If you purchase a good-quality comforter, duvet covers in an assortment of colors or patterns are an easy change for an instant refresh. 3. Update drawer pulls on dressers and wardrobes. Your furniture can take on a completely new look with this quick and simple fix. Drawer pulls are generally easily screwed in from the inside, and require basic tools. A huge selection of pulls are available at home improvement and hardware stores at every price point. If you’ve tried one of the above master bedroom ideas and want to add an even bigger, bolder change to your space, re-painting is a relatively easy and inexpensive route to take. But, there are certain colors that work better in a bedroom. 1. The best tranquil colors that will aid in relaxation. If you’re looking to create a room that will feel like a retreat away from the daily pressures of life, choose something in a muted cool tone. These include colors such as blue, dove gray and even pale purple that leans toward a blue tone. Stay away from vibrant brights in this case, in particular red and orange shades. 2. Choosing a color that will make your room look larger. 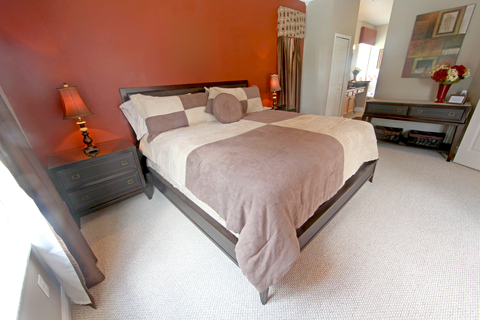 If you’re dealing with a small space and you want to make the room look larger, choose a very light, neutral color. Pick out a shade of eggshell or off-white, or a very pale golden yellow. To make the room appear even larger, paint the walls and ceiling with the same color. This will trick the eye into believing that the ceiling is higher, giving the room the appearance of being larger.